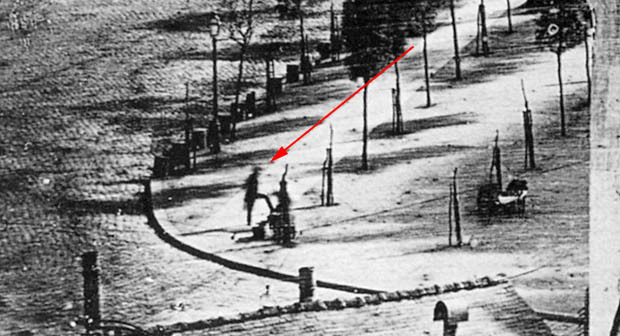 Paris 1838: Do You See the Man at the Lower Left? 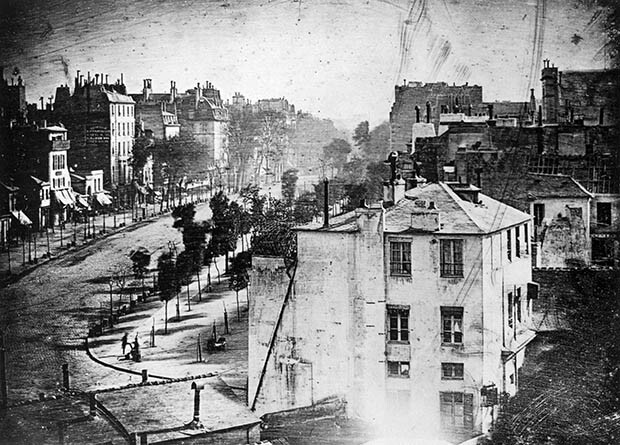 This is one of my favorite firsts: In 1838, Louis Daguerre photographed a man getting a shoeshine on the Boulevard du Temple. Is it strange that no one else is around? Actually, the street is crowded with vehicles and pedestrians; but because they’re all in motion, the long exposure time (ten minutes) required for the first daguerrotypes didn’t pick them up. The man at the lower left getting a shoeshine, on the other hand, is standing still. Because the shoe shiner’s arms are in motion, they don’t show up in the image, making him look armless, like a fire hydrant. Neither person has ever been identified. See PetaPixel, my source for this posting.